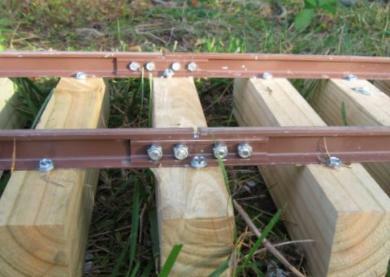 TRACK CONSTRUCTION - WELL UNDER 3 DOLLARS PER RUNNING FOOT! 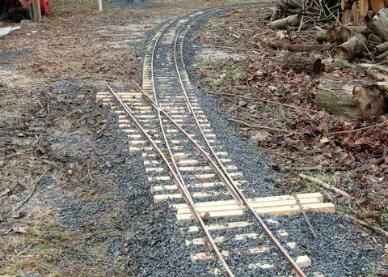 Real Trains Rail - selling for 8.00 per 8 ft 10 inch piece. This length can be shipped UPS. Their rail is 7/8 inch high and has a very realistic profile. Joint bars can be purchased as a pair with bolts and locking nuts for 99 cents a set. than rail shipped from California. Splice bars are 15 cents apiece. #4 frogs are $21, #6 are $23, #8 are $27. I am using 1-inch hex/washer head #10 sheet metal screws, zinc coated. Best price I can find is at Real Trains - 2 cents apiece in bags of 1000 (plus shipping). I am using treated 2x6's ripcut lengthwise, 13.75 inch length. I can get 14 ties per 8 foot piece. Home Depot price is $4.97 per 8-foot piece, which is 35.5 cents apiece. the price per tie down to 17 cents or so. discarded treated lumber at no charge. With ties at 17 cents apiece, you can make good looking track for $2.50 per running foot! $22 a yard (about 1.5 tons). almost twice the price of getting it yourself. crew mills a road before repaving it. 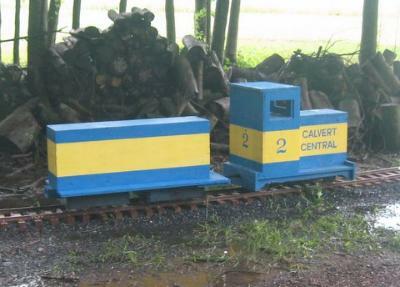 LOCOMOTIVES - YOU CAN BUILD ONE FOR UNDER 800 DOLLARS! out before the batteries run down. 350W motor, chain drive, etc) for $499. You would also need to order a motor controller ($73) and a handheld control ($41). RIDING CARS - JUST OVER 100 DOLLARS! wheels instead of 8, and drawbars instead of couplers. Bearings - I used thrust bearings from Tractor Supply at 3.59 apiece. 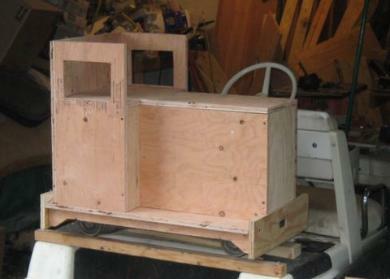 sturdy box-like frame, which is then mounted to the base of the car. a lot of good lumber that way! I'll try to pass along more hints as I find them!